Natural enemies are organisms that kill, or reduce the ability to reproduce, or otherwise reduce the numbers of another organism. Natural enemies are important for managing pest insects using the least toxic methods. Natural enemies of insect and mite pests include predators, parasites, and pathogens. Natural Enemies Gallery on the UC IPM website. A Pocket Guide of Natural Enemies (PDF 956kb) from Oregon State University contains descriptions of common natural enemies with photographs of their various life stages from eggs to adults. To purchase this book go to the UC ANR catalog. 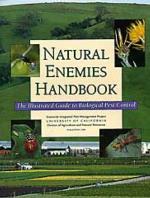 Go to Google Books to read a preview of the Natural Enemies Handbook.